Purchase our 375 ml or 200 ml bottle and continue to use the same bottle over and over. Not only is it better for our environment- you are saving money each time. You don’t have to refill it with the same thing each time- change it up with over 50 different selections in our store to chose from! 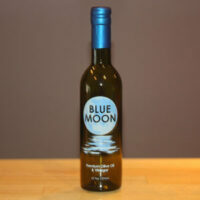 Bring you clean bottle in for a refill and SAVE $1.00 off your next purchase at Blue Moon Premium Olive Oil & Vinegar!